Looking to secure your home and feel safe? If you're looking to increase your home, or office surveillance, this TS-620 camera will satisfy all of your security system needs. This amazing HD video surveillance camera can be control with your smartphone or tablet with simple application download. 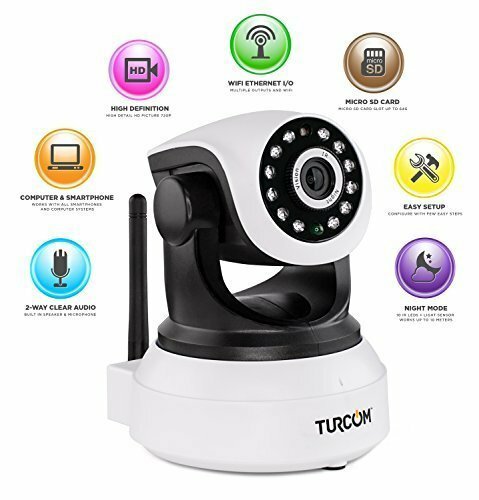 This Turcom plug and play, wireless IP camera allows you to monitor your home or office with a 2-way audio system that is control with your smartphone or tablet, while you are away. The TS-620 has a 3.6 mm HD lens with a dual IR-cut filter auto switch of 12 IR LEDs that provides a clear image and live video and audio up to 32 feet. If you have any questions about this product by Turcom, contact us by completing and submitting the form below. If you are looking for a specif part number, please include it with your message.